I am sorry I have not been posting – I went away to Europe (thoroughly enjoyed myself – I now want to move to Germany for 6 months if I have the chance!) and have just been so busy catching up with everything when I got back that I just did not have the time or energy to come up with any inspiration. Things have changed though and today I finally got round to making something. To be honest, I am not the most talented when it comes to Swiss rolls – more often than not they become cake sandwiches. This was a slightly fancier version as well as I had decided to pipe holly leaves and cranberries as a motif. Line tin with silicone coated baking paper. Whisk eggs, flour, water and vanilla together until light in colour and double in volume – this may take up to 5-10 minutes depending on the speed of your mixer. Add melted butter to the mixture and fold in until full incorporated. Remove a tablespoon of mixture and add colour as desired – in my case I made one tablespoon red and the other green. Place coloured mixture into piping bags. Pipe patterns as desired onto the baking paper in the tin. Place in freezer until fully set (1-2 hours). Pour remaining batter over frozen pattern and even out with spatula. Bake for 8-10 minutes. Remove from oven and roll. Fill with desired filling. Tip: Roll the cake as soon as it is out of the oven to prevent cracks from forming and make sure the cake is not over baked. Just a simple project – hopefully I get into more complex things in the near future but for now – that’s it! Glad to be back. Yes – how about it? Preheat oven to 160° Celcius (fan forced). Cream butter and sugar together until light in colour and fluffy (about 5 minutes). Add zest and eggs and mix until combined. Mixture may look slightly curdled but nothing to worry about. Add flour and mix until well incorporated. Pour batter into a piping bag. Pipe mixture into cupcake liners in a cupcake pan (fill 2/3rds of the way up). Bake in oven for 18-20 minutes or until cupcake springs back when pressed gently. Whisk eggs and sugar together until smooth in a microwave safe container. Stir in lemon juice, lemon rind and butter. Pop into the microwave and cook for 60 seconds. Remove from microwave and stir thoroughly. Repeat Step 3 until mixture is thick enough to coat the back of a spoon and when a line is drawn through it with your finger it stays nice and sharp. Leave to cool before use. Place lemon tree template underneath wax paper. Pour melted milk chocolate into a piping bag and pipe the tree trunk. Mix some green gel food colouring into a portion of the melted white chocolate and place into piping bag. Pipe leaves of tree. This is done by piping a small dot and drawing the tip of the bag away, creating a tail that resembles the tips of the leaves. Leave until fully set. Mix some yellow gel food colouring into remaining melted white chocolate and place into piping bag. Pipe lemons onto tree by piping small dots. Remove from waxed paper by carefully peeling the wax paper away. I like to do it at the edge of the table. Your lemon tree is ready for use! Cut a slot into the lemon cupcake in desired area that is slightly longer than the width of the chocolate tree trunk. Gently insert tree into slot. Pipe or spoon lemon curd onto cupcake. Unfortunately, I forgot to photograph my set up for this project! However, it is similar to that of my Flamingo Cupcakes. The only difference was the props. 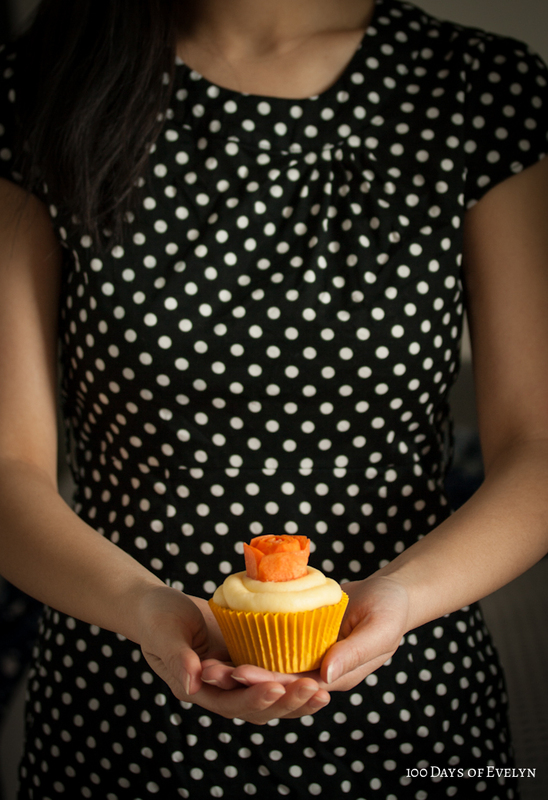 In this particular photograph, the gray background is a cashmere scarf and the cupcake is sitting on a burlap bag. And that’s all for today’s post! I have an extremely busy week ahead but I will try my best to be on time for my next post. 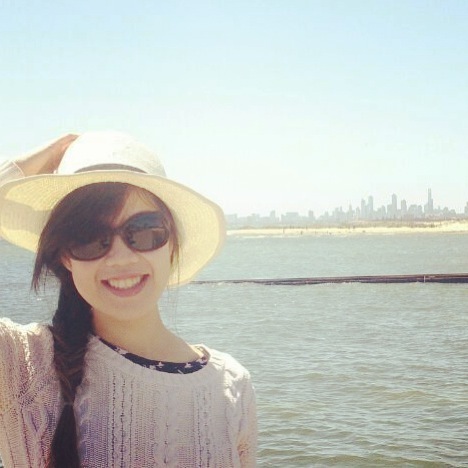 Blogging and full time work is not easy! I used to bake 8 inch cakes. I then baked 6 inch cakes because we didn’t need so much cake. I took it a step further and decided to bake a 4 inch cake because let’s face it – two girls experiencing the sad slowdown of metabolism in their late 20s do not need to eat any more than what’s absolutely necessary. Broke out my trusty chocolate cake recipe and decided to go with a coffee flavoured buttercream. I was extremely pleased with how the flavours turned out – a nice balance of chocolate and coffee with just the right amount of moistness. Then came the decoration dilemma. I tried to pipe swags and failed miserably – I’m still not quite talented enough for that sort of thing. I then tried to pipe cornelli lace and failed miserably on that front too! Things were getting desperate. After more brainstorming I decided on a walnut border at the bottom. And then it hit me – I’ll have a squirrel holding a walnut as the cake topper! Once again, I apologise for my extremely non step-by-step series of photographs of this cake. I just can’t remember to stop at every step to take a photograph! 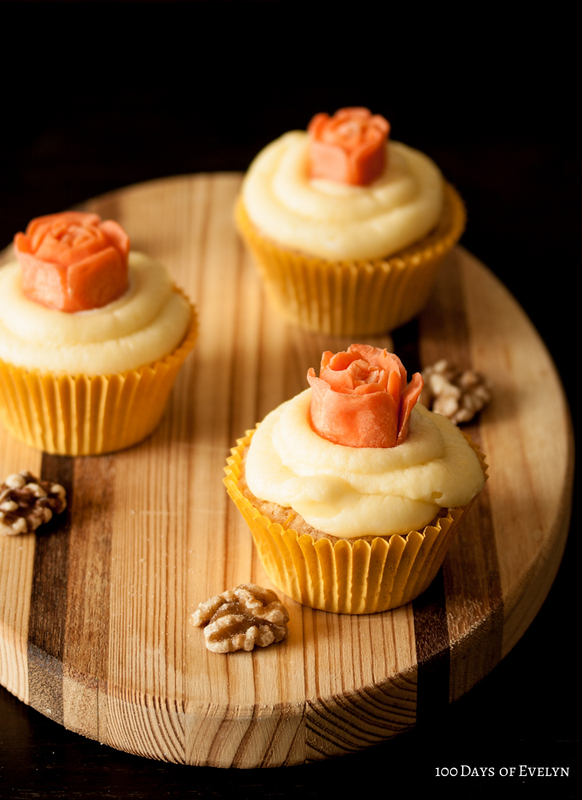 The recipe used in this cake has been outlined in my previous post, Caramel Spiral Cupcakes. It makes 2 rounds of 6 inch cakes, enough to complete a layered 6 inch cake. Dissolve instant coffee in 3 tablespoons of boiling water and leave to come to room temperature. Cream butter and sugar together until pale in colour and increased in volume. Add instant coffee solution into batter slowly, mixing until well incorporated. Melt chocolate (my favourite technique explained here). Placed melted chocolate into piping bag and snip a very small hole at the top. Place squirrel template under waxed paper. Pipe squirrel outline and then flood entire area. 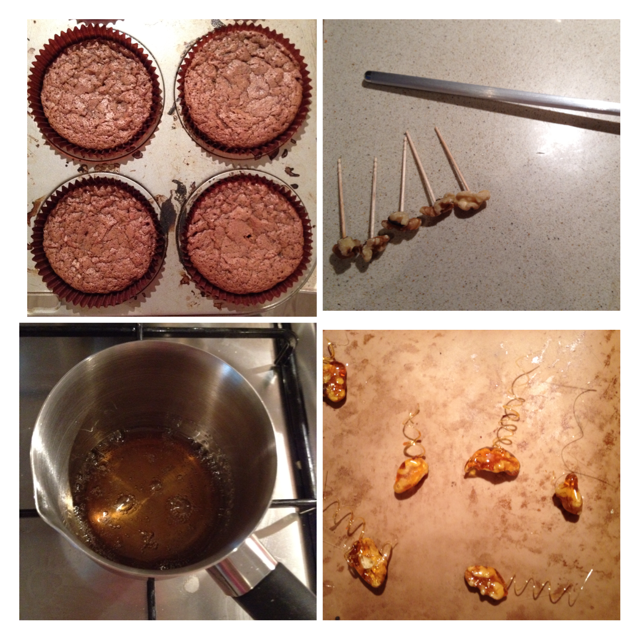 Press a piece of walnut into the squirrel’s hands before the chocolate sets and leave until fully hardened. Peel off wax paper carefully and leave to set. Fill cake with buttercream and cover completely. Press walnuts into the bottom of the cake to form a border. Place squirrel on top of cake – squirrel should be able to stand on its own. If not, prop up with a walnut. I hope you enjoyed this project as much as I did making it. I thought the cake turned out quite well and it’s a simple technique that can be applied by anyone. P/S: I’m obsessed with Instagram at the moment, admittedly a little late to the bandwagon but better late than never, apparently! If you’re interested in random photos from my daily life as well as my projects click here. 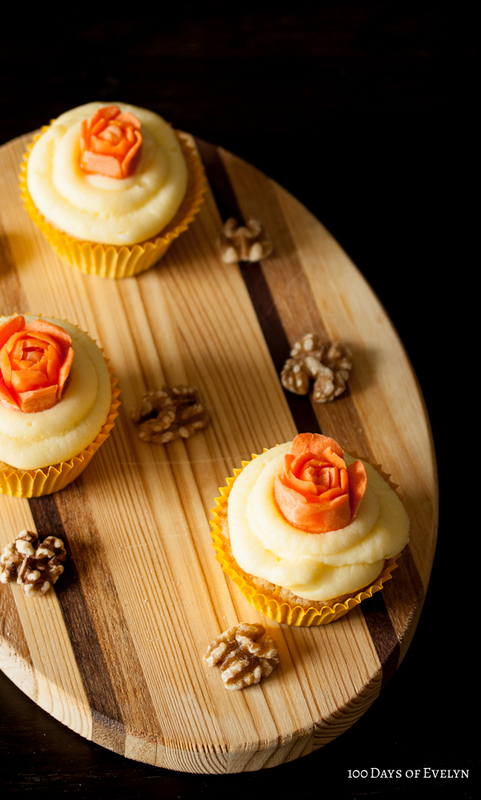 I have always been intrigued by sugar work, and recently I decided to make some cupcakes with caramelized walnut spiral toppers. I make chocolate cupcakes on a fairly regular basis. I have been experimenting with a few recipes and I have finally come up with a fairly simple recipe that does not require milk. Milk is not a staple ingredient in my household so I find it irksome to have to go out and buy a carton and end up pouring the remainder down the sink 2 weeks later because nobody drinks it. Anyway, I had a lot of fun making these – not too time consuming but quite striking in appearance. 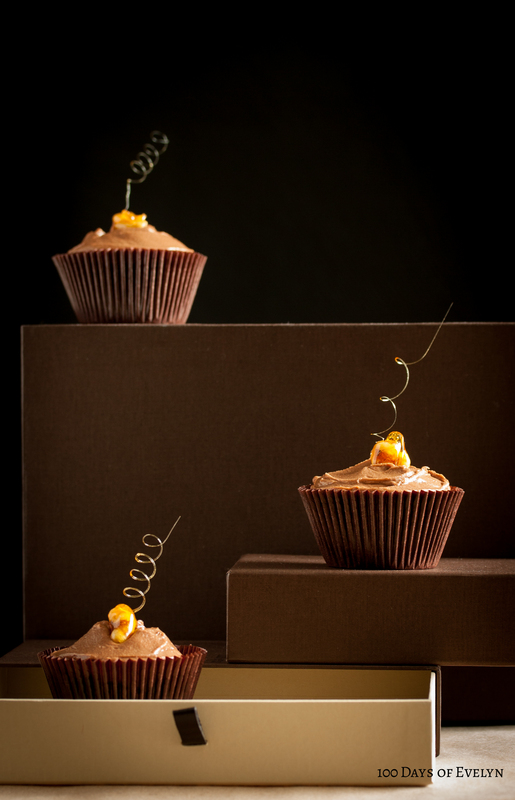 Recipe has been divided into 3 parts – the cupcake, chocolate buttercream and the walnut caramel spirals. Preheat oven to 160°C (fan forced). Combine all ingredients from List A in a microwave safe bowl and cook in 30 second intervals until ingredients are melted, stirring in between each interval. Mixture may look like it has split slightly but that is okay. Set aside. Working off the ingredients from List B, cream butter and sugar in a food processor until light and fluffy. Add eggs one at a time, beating and scraping the sides of the bowl down between each addition. Pour warm mixture prepared from List A into the bowl and mix. Add self-raising flour and cocoa powder and mix until well combined. Mixture will be fairly runny. Spoon into cupcake liners and bake for about 20 minutes or until skewer comes out clean when pierced through the middle of the cupcake. Leave to cool completely before decorating. Cream butter and sugar together in mixer until light and fluffy. Pour melted chocolate in and mix until well incorporated. Spray some cooking oil onto cylindrical rod to facilitate easy removal of spirals. Pour sugar and water into a small pot and heat, swirling the pot around gently every so often. Once it turns a lovely caramel colour, turn off the heat. Leave to cool for a while, checking intermittently by dipping the a walnut into the mixture and lifting it out. Caramel is ready to be spun when a thick thread of caramel drips off the walnut rather than small drops. This may take some experimenting. Lift walnut out and wrap the caramel strand around the cylindrical rod in a spiral around the rod. Slip rod off and place walnut on a silicone mat to cool. Repeat with other walnuts. If caramel hardens too much during the process, reheat gently until it softens again. Notes: Caramel is extremely hot so always be careful. This method takes a little practice but once proficient it can be very rewarding. Also, these decorations are extremely sensitive to humidity – they are best prepared 2-3 hours before serving. My first true authentic experience of fortune cookies was in San Francisco about 2-3 years ago, where I saw them being made in a small store in Chinatown. I bought a bag of them and had the joy of multiple fortunes (mainly proverbs rather than actual predictions). Since then, I have made paper fortune cookies for dinner parties but that’s about it. Pyramid pattern prototypes – waves, cornelli lace. I decided on a geometric pattern in the end. As you can probably tell from my projects, I enjoy lattice work. I wanted to make lattice pyramids – for no real particular reason other than the pleasure of making them. Initially, I had planned to make pyramids that housed nuts in them, but during my experiments I realised that nuts were too heavy, my pyramids just fell apart. Then it came to me – paper is light, right? 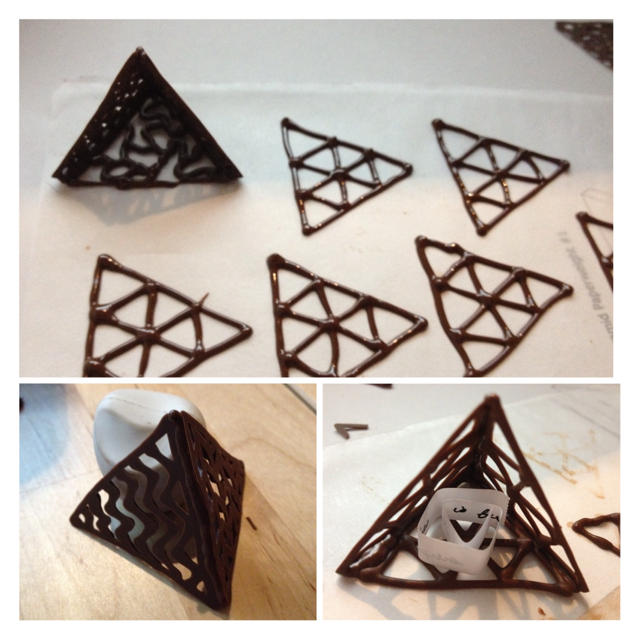 I’ll make chocolate fortune pyramids! The perfect after dinner snack – I’ll even pop a mint leaf in there. 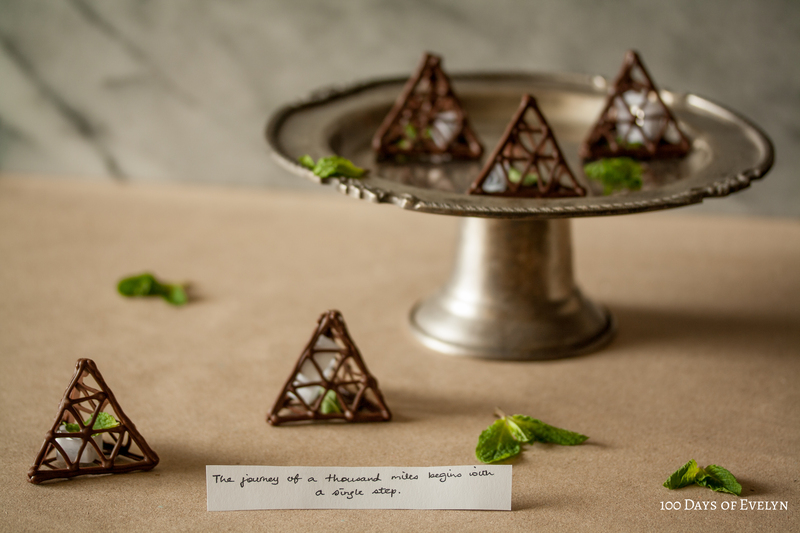 They will be after dinner chocolate mint fortune lattice pyramids! Recipe below – the hardest part of this project is probably the waiting for the chocolate to set over the multiple stages and consequently, the multiple stages of reheating chocolate that’s been sitting in the piping bag. Other than that, it’s pretty straightforward! Print template and place under waxed paper. Place melted chocolate into piping bag and snip a very small hole off the top. Pipe according to the guidelines on the template. Leave to dry. 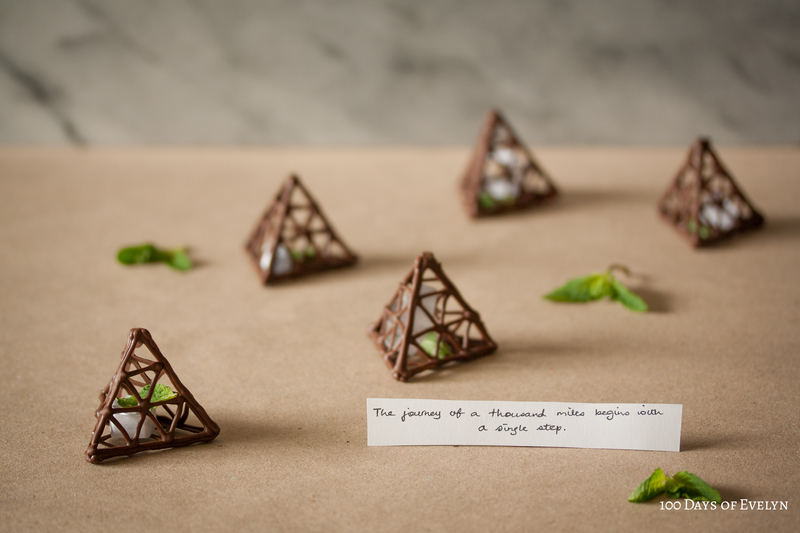 Peel pieces off waxed paper carefully and assemble into pyramids by first stacking the first two together with a prop to support them and piping a stripe of chocolate at the seam to join them. Then, do the same for the other side. Pop the entire piping bag with chocolate into the microwave whenever it starts to firm up for 10 seconds to melt it down again. Place fortunes and mint leaves into the pyramid and finally, attach the bottom the same way as the sides. Note: If you are using coverture chocolate, chocolate must be in temper for this project. Compound chocolate will not require tempering. Hope you enjoy making them! Also, the quote in the photograph is one of my favourites – it reminds me that in everything, one has to start somewhere. Even if it is just a single step. So I got it into my head that I could carve carrots if I wanted to after watching this video on YouTube. Sure, I didn’t have the right knife (used my smallest utility knife that was still too large) and I’ve never had any experience carving carrots and it was rated as an Advanced Lesson. 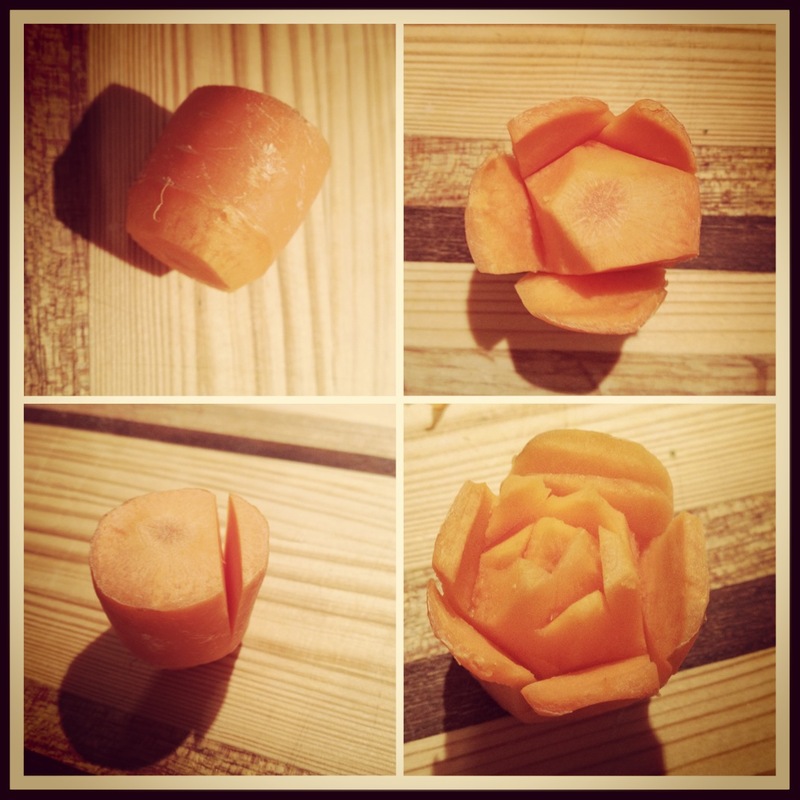 But hey, I can cut vegetables – surely I can carve a rose! It’s practically the same thing! Right? As you can see from my rather indelicate roses, no – they are not quite the same thing. I actually tried to practice a little more and try to make a more respectable specimen but failed miserably. I would like to think they still echo the vague idea of a rose, but you can be the judge of that. My first attempt. Very blocky result. I nearly decided not to post these up but I decided that I should show my failures as well as my successes. After all, not everything I make is going to turn out the way I want them to. In this particular case, I really do think the knife was to blame (poor workwoman blaming her tools) because the blade on mine was just too thick and wide to make cuts that were as delicate and curved as they needed to be. I might have to try to bring home a surgical scalpel next and see if that helps. Combine all ingredients and divide into cupcake liners. Bake for 15-20 minutes until skewer comes out clean after insertion. Leave to cool completely before frosting. Cream all ingredients together until light and fluffy. Transfer to piping bag with a large round tip and pipe a spiral on the cupcakes. A while ago I saw a photograph of profiteroles decorated into swans. I thought they looked elegant. Then the bright idea came to me about 2-3 weeks ago – why don’t I try to make a peacock profiterole? After perusing many images of peacocks I sat myself down and drew templates for the feathers and the head. It took a fair bit of effort but I got there eventually. At first I thought it was going to be easy. 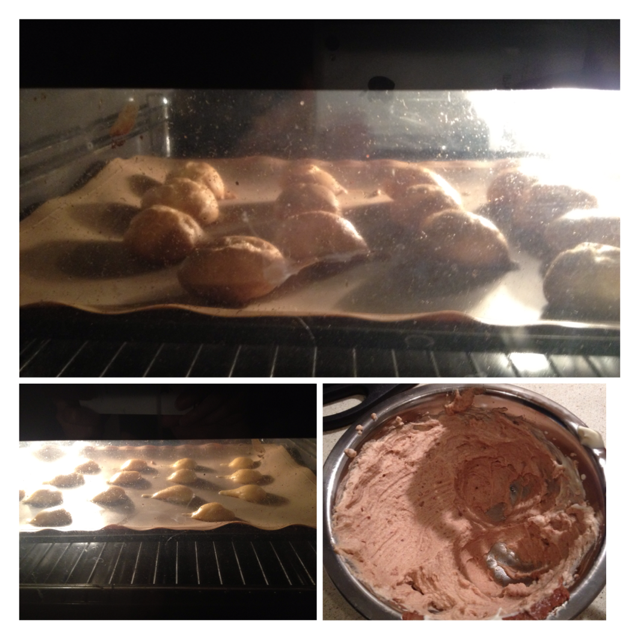 Step one – bake profiteroles and fill them. 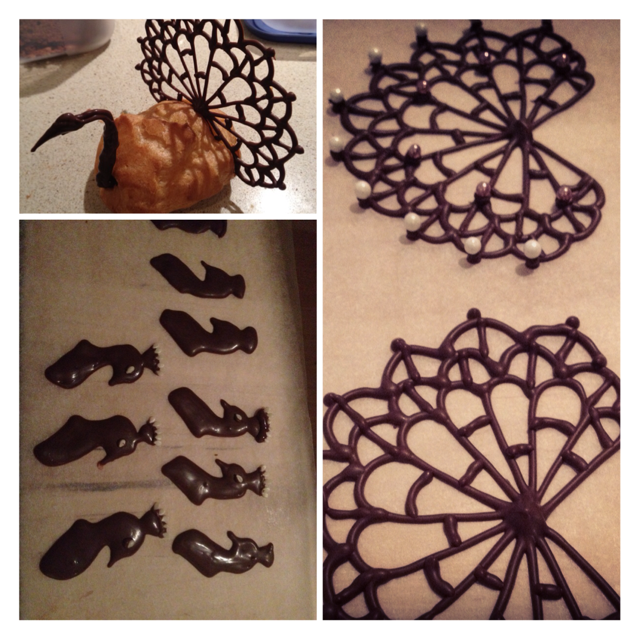 Step two – pipe chocolate decorations. Step three – stick them on. Step four – photograph them. How hard could that be? I’ll get this over and done with in 3 hours tops. Yes, my oven needs a good clean. I am getting to it! Profiterole recipe from here. The only difference is that I piped mine into teardrop shapes about 3-4cm with a flick at the end to simulate the peacock’s tail. It took me a couple of batches to get to the optimum size but eventually I got there. For the filling, I whipped some cream and added some leftover chocolate buttercream to it, which produced a medium-bodied chocolate cream. I then poked a hole at the bottom of my profiteroles and piped some of the cream into it. Okay. So far so good. I only had to bake a couple of batches of profiteroles. That’s okay. Prototype peacock at top left corner – proportions and head all wrong. Had to make another batch of smaller profiteroles and redesign everything. 1. Place template underneath waxed paper. 2. Pour melted chocolate into piping bag and snip a very small hole at the tip (roughly 1-2mm). 3. Carefully pipe chocolate according to template. Make enough for however many profiteroles with some extras in case of breakages. 4. If embellishing, place decorations as desired. I used sesame seeds for the eyes as well as the top of the peacock’s comb. 6. Carefully peel waxed paper away from decorations. It all sounds easy enough but I broke many of my decorations and had to redo them – partly due to an initial design flaw in my template. It got much better after a few tweaks to the design. Sure, I broke 2 out of 3 of my peacock feathers. I can do this! Using a very sharp knife, cut slits into the profiteroles and gently prod the chocolate pieces into the slits. I cut the slits at a slight angle as I felt it was more aesthetic that way. 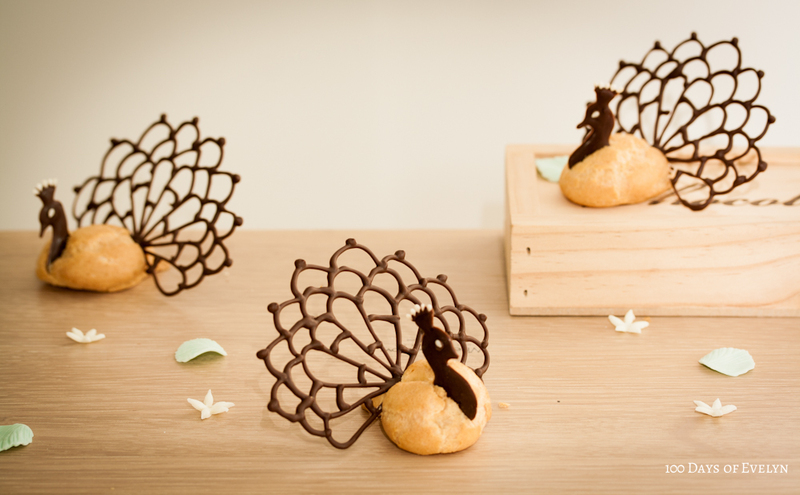 When attaching the peacock feathers, ensure that the centre of the tail (the portion where all the lines meet) is embedded in the profiterole otherwise your peacock construction will fail. Yes, this is from experience. That is why my final template actually has two sections less than my original design – it is to ensure that the midpoint can be embedded easily. My friend suggested that I try out Canon’s Speedlite to assist in lighting my indoor night shots and this was my first attempt using it. I am not entirely happy with the photograph – I assume it takes a lot of practice to get it right but somehow the styling and detailing etc just did not work out for me. I don’t hate it, but I don’t love it. Probably need a lot more practice. This was one of the most time consuming projects I had ever undertaken – probably because it was something that I had to trial and error. Overall, I was pleased with the results and I think if I were to attempt to recreate these it would be much, much easier and quicker. Also, I finally got round to learning how to use Adobe Illustrator so from now on I’ll be providing templates in PDF format if required for all my projects! In early 2012, I quit my job and had exactly 100 days before my next job started. 100 Days of Evelyn. To learn more, read About Me.